It is with deep sadness that we inform you of Buddy's passing. This morning, on his own in a peaceful moment, Buddy crossed the Rainbow Bridge. As many of you know, Buddy came to us under unusual circumstances. His previous owner was terminally ill and Buddy spent almost 6 months alone. Sure, he was fed and walked by caring friends, but this social butterfly needed much more companionship. With his age and "train-wreck" medical history, when asked to foster him we realized he needed a special forever home - ours. Our decision was proven right when Tommy, his previous owner, passed away the next morning. Tommy was able to rest knowing Buddy was safe. Even though we only knew Buddy, or as we liked to call him B-Boy, for a relatively short time his impact on our lives was great. We always marveled at his ability to persevere. Through all his trauma, nothing could keep him down. He enjoyed his time with Lucy, becoming very good friends. They provided us with many hours of entertainment. Their pull-toy battles around the house were quite comical. Last summer, it was Buddy who encouraged Lucy to go in to Long Island Sound for her first "real" swim experience. Lucy was soooo proud as she swam around for the first time. Buddy loved the water and his Retriever instincts were apparent. He would swim to Connecticut to bring back a piece of driftwood. 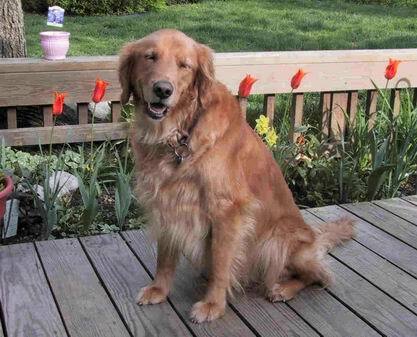 Even though losing Buddy is difficult, we have fond remembrances that will keep us smiling and laughing. We are happy that Tommy and Buddy are now reunited.